1) There is no deity but God alone and 2) Muhammad is His Messenger. Together, they are known as the shahāda, the Muslim testimony to faith. Not only does the shahāda form the bone marrow and crux of Islam, it is also necessary to testify to it in order to become a Muslim. Without acknowledging the shahāda, a person cannot become a Muslim! 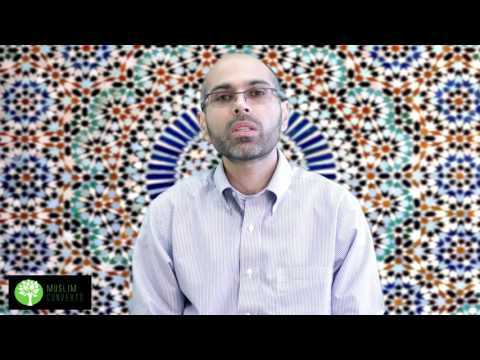 In this lesson, we will go over the meaning of the shahāda as well as some of the basic features, practices, and implications associated with converting to Islam. In order to become a Muslim, one must pronounce the shahāda. It is common practice to utter the shahāda in Arabic. If you are not a Muslim and you are seeking to convert to Islam, please repeat after me: Ash-ha-du… an Lā ilāha …illAllāh …wa Ash-ha-du … anna … Muhammadan … rasūlullāh. These Arabic words can be translated in the following way: I testify that there is no deity but Allah and I testify that Muhammad is the Messenger of Allah. If you said these words with real sincerity, then congratulations, you are now a Muslim! It does not matter who you are, how you were born or what you did in the past. By sincerely testifying to the shahāda, all of your past sins are erased. In short, you are born again! Before discussing some of the practices that become necessary after conversion to Islam, it’s important to look into the deeper meanings of the shahāda. The word shahāda literally means to witness and to testify to a fact, just like how one would testify in a court setting. Notice that the word “I believe” is not used and this is an important point to remember for the following reasons: When one enters Islam, mere belief where one only thinks that something may be true is not enough. One is expected to testify to the truth and fact that Allah exists. One is expected to testify to the fact that He is the only God and that Muhammad is His Prophet and Messenger for all of humankind. But what do these two statements really mean? The first part of the testimony of faith, Ash-ha-du an Lā ilāha illAllāh or “I testify that there is no deity but Allah,” can be understood in several complementary ways. First, it is a rejection of polytheism*. Unlike other religions who believe that there are many gods, Islam rejects the very existence of multiple gods. Rather, it states that there is only one God and that He is the Creator and Sustainer of all of existence. Recall our discussion of God in Islam and how He is not an object that exists alongside other objects in in the world. He is the unconditioned source and cause of all existence. The second, complementary meaning of Ash-ha-du an Lā ilāha illAllāh means that there is no deity worthy of worship except for Allah. Although someone may believe in one creator God and reject the existence of other supernatural gods, he or she may still worship things other than God. This may be the worship of money, fame, power, food, or other things. The Arabic word for worship, ʿibādah literally means to “enslave oneself to something” for it comes from the root word ʿabd or slave. When we say “worship,” in Islam, it means to enslave one’s heart and soul to something to the point that that entity is all one thinks about. For example, a person’s whole life may be devoted to their physical appearance. As a result of this, this person may sacrifice prayer, going to the Masjid, or even abandon fasting altogether for the sake of working out at the gym. This would be considered a worship of an entity other than God. Ash-ha-du an Lā ilāha illAllāh means to testify that no one or no thing takes priority before Allah. The love of money, fame, power, love of oneself or anything else must not come before Him. In order to achieve this, one must therefore free oneself from any form of enslavement to Allah’s creation in order to be a true Muslim! The second testimony of faith, Ashhadu anna Muhammadan rasūlullāh, or I testify that Muhammad is the Messenger of Allah, can also be understood in several complementary ways. First, it is to testify that Muhammad was a truthful Prophet and that he was selected by God to deliver His message to all of mankind, primarily through the revelation of His Holy Book, the Noble Qur’an. It is also to testify that he was the last and final Prophet and Messenger from God. After him, there are no more Prophets or Messengers. Among other things, this message confirmed the Prophethood of previous Prophets like Abraham, Moses and Jesus. The message confirmed that there is an unseen world (ghayb) in which angels, spirits, demons, heaven and hell exist. It confirmed the coming Day of Judgment where all of mankind’s deeds will be judged before God. The message also contained God’s will to humankind where they were instructed to pray, fast, help the poor and be compassionate to His creation. Shias believe that the Imams of the Ahl al-Bayt (as) are of fundamental importance for Islam. Among other important reasons, they are the keys to properly and correctly understanding the teachings of Allah and His Messenger. Without the Ahl al-Bayt who succeeded and preserved the message of Islam, all we would be left with would be fallible opinions and interpretations of Islam. Only the Imams of the Ahl al-Bayt (as) had perfect and infallible knowledge of Islam. Only they had an unerring understanding of Islam and only through them can a person reach perfection of faith. The other complementary meaning of the second part of the shahāda is that the Prophet Muhammad is supposed to be the primary role model for our lives. This means that we should adopt his mannerisms, which include, among other things, respecting and serving humankind, especially our parents and the poor. way exhaust the vastness of the Messenger’s Prophetic example! But I hope that you got at least a glimpse of what it means to take the Prophet Muhammad (s) as a role model and example to follow in life. After one converts to Islam, there are a series of religious obligations that one must follow through. The first obligation is to perform ghusl, or a ritual bath that spiritually cleanses a person and readies him (or her) for obligatory ritual practices. These practices, among other things, include the following: 1) praying five times a day, 2) fasting during the Muslim month of Ramadan, 3) paying the zakat tax to the poor and needy and if possible, 4) performing the Hajj pilgrimage to Mecca at least once in a person’s life. These fall under the rubric of Furūʿ al-Dīn, or “Practical Branches of Islam.” We will look into these rituals in more detail in the following lessons, but for now you should just keep in mind that these practices are meant to keep you in constant remembrance of Allah and help remind you that He must take priority in all aspects of your life. Tawḥīd, or Oneness of God: where God is the one and only Creator of the universe. ʿAdālah, or Justice: where God is Just and does not mistreat or do any evil against His creation. God’s justice, however, is balanced and overwhelmed by His mercy. If humans received what they truly deserved, few would find salvation . Nubūwwah, or Prophethood: where God, since the creation of mankind, has sent a 124, 000 Prophets, one after the other, to spread God’s message so that they may be guided to Him. Imāmah or Divine leadership: where God appoints divine leaders to continue guiding humankind and preserve Islam after the death of the Prophet Muhammad. Qiyāmah or Resurrection: where God will resurrect mankind and hold each and every person accountable for the deeds that he or she has done. The state of a person’s soul will ultimately determine whether the person goes to heaven or hell. In the next lesson, we will have a more detailed overview of the uṣūl al-dīn, inshā’ Allāh. With that being said, the following is very important to keep in mind: Entering Islam and uttering the shahāda is not simply acknowledging a set of doctrines, beliefs and ritual practices. If it was, then the shahāda would be a very feeble thing for it would not take you very far in your spiritual and moral life. Instead, the shahāda is meant to be a transformation of one’s entire being. If one simply believes, but his or her life is not completely transformed, then he or she has not really testified to Ashhadu an Lā ilāha illAllāh wa Ash-ha-du anna Muhammadan rasūlullāh. The word for religion in Islam is called dīn, which comes from the old Persian word dā’ina, meaning “a way of life.” The sixth Shiʿi Imam Jafar as-Sadiq (as) explains the wider transformative implications of acknowledging Islam as one’s religion in the following ḥadīth: if you want to know the religion of a person, do not look at how much he prays and fasts, rather, look at how he treats people. What does transformation mean in Islam? Transformation means that one’s life is based on loving God with all of his or her being, obeying and following His commands, loving and serving His creation (even one’s enemies), and above all, observing inner humility for without real humility of the heart, no transformation can be possible. How can an arrogant person ever want to really change? With humility, one acknowledges that this material world is not the only world. One acknowledges that there is an unseen world (ghayb), like the Afterlife where we will be judged with God's justice and mercy. The door through which one enters Islam is called the shahāda. Shahāda literally means to testify or bear witness similar to how one would testify in court. The shahāda in the Muslim religion is to testify that 1) there is no deity but Allah alone and that 2) Muhammad (s) is the Messenger of Allah. The first part of the shahāda means that we should reject polytheism and affirm monotheism* only. It also means that we should worship God only and make Him a priority in our lives. If one makes the world and its contents (like money, power or fame) the sole object of one’s love, then one is, in reality, worshipping a “god” other than Allah. We cannot emphasize this point enough. Worshipping in Islam simply means to surrender one’s heart, soul and mind to something. The second part of the shahāda is affirming that Muhammad is a Prophet and Messenger sent by Allah to guide humankind for people's salvation. It also means that as the last and final Prophet and Messenger from Allah, we are to take his teachings as the blueprint of how to lead the proper religious life. This not only includes various ritual practices, but also proper mannerisms and behavior. If a Muslim wants to perfect his or her Islam, he or she must also pay heed to the Prophet Muhammad’s command of following his Ahl al-Bayt (as). The Ahl al-Bayt were the divinely guided successors after his death. Simply believing and performing ritual practices, however, is not enough. A Muslim needs to go further by always struggling to better himself or herself and always being mindful that Allah is watching. The only way that bettering oneself, that is, transforming one’s inner self, can come about is through inner humility. For it is only in humility and not in arrogance that the human heart truly surrenders itself to God. The major ablution (bath or shower) required in Islam so as to be able to perform obligatory ritual practices. The shahāda is the Islamic Creed, the fundamental key of entering Islam. How is the shahāda pronounced and what does it mean? Ash-ha-du… an Lā ilāha …illAllāh …wa Ash-ha-du … anna … Muhammadan … rasūlullāh. These Arabic words can be translated in the following way: I testify that there is no deity but Allah and I testify that Muhammad is the Messenger of Allah. Does the shahāda differ among Muslims? Ash-ha-du… an Lā ilāha …illAllāh …wa Ash-ha-du … anna … Muhammadan … rasūlullāh. Translation: I testify that there is no deity but Allah and I testify that Muhammad is the Messenger of Allah and I testify that Ali is the vicegerent and saint of Allah. How is Imāmah an extension of the Prophet Muhammad’s (s) message? After the Prophet Muhammad, the Imāms of the Ahl al-Bayt (as) preserve the authentic interpretation of Islam as intended by the Prophet (s). It is changing your whole life and personality in accordance with what Allah wants from us. What does it mean to follow the Prophet as a role model? Among other things, it means to adopt his compassion and love for God’s creation and to acquire inner peace in God. Why do I have to perform ghusl after converting to Islam? It is a ritual purification that enables you to perform ritual practices like prayer or fasting, which are obligatory in Islam. What can I do to treat the shahāda as a fact rather than just a belief or opinion? Consider the Afterlife as more important than this one. That is the first step of knowing God.